On a Mnt. view lot. 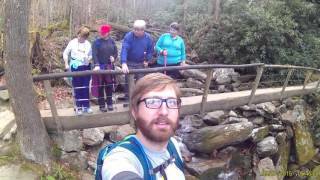 5 minutes from Gatlinburg! Majestic Manor is a spacious, three-story mountain cabin with three large bedrooms and luxurious living spaces. With its wood-planked interior finishes and large windows, Majestic Manor is a thing of beauty perched on a high vantage point that surveys the wooded mountain terrain. Double-decker balconies to the rear of the cabin are lavished with old-fashioned rocking chairs as well as an outdoor hot tub on the lower level – the perfect place to enjoy the mountain breeze and the song of the forest creatures as you soak your cares away. Inside, the manor’s main floor houses an open living space with a cozy sitting room a formal dining room and a full kitchen all lit by the wall of glass windows leading to the porch and dozens of cannister lights that cast the knotted pine paneling in a warm glow. The sitting room is furnished with leather sofas, a stone fireplace and a wall-mounted flat screen. The dining table offers seating for six guests, and the kitchen is equipped with cookware and utensils and new stainless-steel appliances. Guests can also cook outside on the provided charcoal grill. This cabin offers total comfort and utility with complimentary Wi-Fi and laundry facilities. 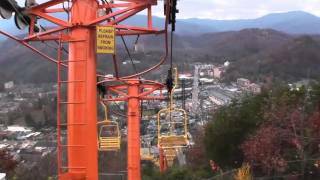 It also offers access to additional community amenities as part of the Gatlinburg Falls Resort. These include an outdoor swimming pool and sprinkler, a sauna and a fitness center. Sleeping arrangements: The three private bedrooms at Majestic Manor are essentially all master bedrooms with king-sized beds, flat-screen TVs and full bathrooms connecting to each one. Additional sleeping space is provided at the manor through a sofa sleeper and a set of twin-sized bunk beds in the game room. Linens are provided for all sleeping areas. There is another half-bath located in the shared living space. Majestic Manor harbors several bonus spaces that go above and beyond the calling of a comfortable home. One is the game room, located on the lower level of this vacation rental, with its full-sized pool table, foosball table, card table and multigame arcade console. This room also offers a leather sofa and a television. The other bonus space comprises an impressive home theater system that takes family movie night to the next level. This room houses a large screen and stadium-style leather seating for up to eight viewers — a miniature cineplex in itself. 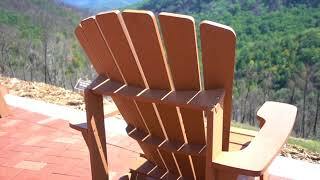 Majestic Manor is conveniently located less than ten minutes from the Great Smoky Mountains National Park, where visitors are welcome to fish the streams and paddle the lakes, picnic in designated areas, explore the historic cabins and hike or bike the nature trails — which lead through forest and mountain, past high lookout points, hidden waterfalls and fields of wildflowers. Another regional favorite is Anakeesta, which offers zip-line tours, a tree-canopy walking tour and a gondola ride to a mountain peak, offering a gentle, sweeping bird’s-eye view of the surrounding valleys and hills. Closer to the heart of the city, guests can enjoy the maritime wonders of Ripley’s Aquarium of the Smokies or challenge themselves against extreme accomplishments of all kinds at the Guinness World of Records Museum. If you are lucky enough to stay in Tennessee during the mild summer months, spend a sunny afternoon chasing an adrenaline rush at the Wild Bear Falls Water Park or strolling through the Great Smoky Arts & Crafts Community — home to more than 120 shops, galleries and studios filled with unique trades and original works. Nightly rates at Majestic Manor range from $147.00 to $456.00 with a two-night minimum stay. Final pricing will include additional fees: a booking fee, a cleaning fee, a potential community application fee and state and local taxes. Please contact us for an exact quote.